There are those that look at things the way they are, and ask why? Often, the most intense forms of beauty rise from the ashes of tragedy. Such is the story of how a bombed-out church from the London Blitz ended up in my town in Missouri — restored, renewed, rehallowed. Her name is St. Mary, Aldermanbury, and she's got quite a story to tell. St. Mary, Aldermanbury stands tall after rising from the ashes — not once, but twice in her long life in Old London, not far from St. Paul's Cathedral. Originally a 12th century parish church that evolved through the centuries, she was almost destroyed in the Great Fire of London in 1666. It was then that London's most renowned architect Christopher Wren began her restoration. While preserving the outline of her Gothic integrity, he rebuilt her with a fresh vision born of his own architectural genius in the English Renaissance style. Once restored, she thrived as a proud Wren parish church for almost three hundred years until 1940, when a Nazi incendiary bomb left her burned out, roofless, blackened, and desolate. Languishing in this frozen state of despair well into the 1960s, hope was running out for St. Mary, Aldermanbury. There was no Christopher Wren this time — only the specter of certain demolition. Who would rescue her now? In a synchronicity of novel and historic events, here's how St. Mary's got to my little town in Mid-America. On March 5, 1946, Sir Winston Churchill stood before overflow crowds at Westminster College in Fulton, Missouri, to deliver his famous "Iron Curtain" speech (The Sinews of Peace). It was after that historic and prescient speech that the college decided to establish a "Churchill Memorial and Library," but they needed a very special kind of memorial. 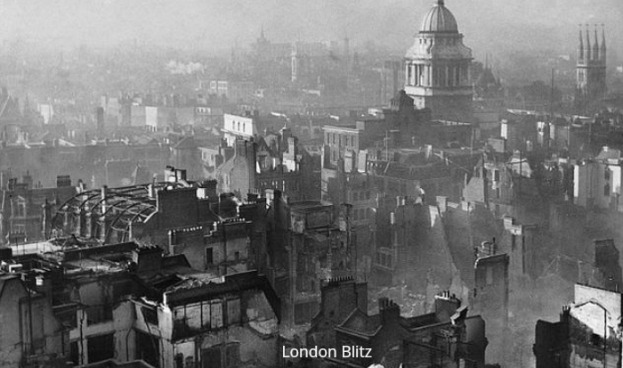 And then one day in 1961, college President Dr. Robert L. D. Davidson picked up Life magazine and found an article featuring several London churches bombed in the Blitz and still languishing with uncertain futures. It was at that moment, in a surge of wild imagination, that he thought: why not? Why not bring one of those bombed-out churches scheduled for demolition here to Westminster College and restore it — yes, why not restore it to its former Christopher Wren glory! This could be the perfect — albeit, outlandishly impractical — answer to the school's desire for a Churchill memorial. The idea was far-fetched, "an impossible dream," even foolish, said some. But Churchill himself called it "an imaginative concept." And so, this improbable idea, born in the imagination of Dr. L. D. Davidson and blessed by the famously imaginative Winston Churchill, began to take form. In an unprecedented act of American chutzpah, St. Mary's-blackened stones were carefully dismantled, cleaned, numbered, and sent sailing 4,500 miles away from home. The project — like most imaginative ideas birthed into the world — met with untold obstacles, delays, and mishaps. Because the numbered stones got mixed up in transport, the London Times called it "perhaps the biggest jigsaw puzzle in the history of architecture." Undaunted, the construction crews managed to put her back together. Restoration artists and artisans from Britain and America devoted themselves to the painstaking work of repairing and reproducing her interior with historical accuracy. Volunteers rallied around the project and local needlework artists offered their skills in creating the kneeling cushions, using historic London symbols and patterns. For the five years from groundbreaking to completion, this daring "impossible dream" riveted the entire community from ground-breaking to completion (1964-1969). Finally, the day arrived for introducing to the world the lovingly restored St. Mary, Aldermanbury. On May 7, 1969, after a speech by Lord Mountbatten of Burma to a crowd of thousands, St. Mary, Aldermanbury, was dedicated and "rehallowed" in the Anglican tradition. St. Mary's was entirely and miraculously transformed—now the most imaginative and far-fetched "Phoenix" of all of Wren's churches. And underneath the church now resides the National Churchill Museum. Even in its loving and faithful restoration, St. Mary's was not exactly the same, but a fresh offering to history — an old church in a new place, with a new function — with treasures and additions from other historic British churches. And it continues to evolve. After the 9/11 attack, an ornate and valuable Christopher Wren pulpit was given to St. Mary's by generous Londoners. I live but a few blocks from St. Mary, Aldermanbury, and hear her tower bells chime on the hour. I pass by her nearly every day and sometimes stroll in her garden and attend special services and concerts there. St. Mary's presence in my community is a focal point geographically in my life, but also a galvanizing presence for my spiritual life as well. I think of how short-sighted and unimaginative I am to think of tragedy and defeat and set-backs as final, like misery "set in stone." I have learned that even stones can be picked up and hauled across the ocean and resurrected into new life. Before his death in 1965, Churchill commented that the restoration of St. Mary's in Fulton would not only be "an imaginative concept," but would serve as a symbol of the "ideals of Anglo-American association" for the sake of peace and hope for the future. That Roosevelt-Churchill "association" helped save us from fascist tyranny in the last century. And yet, our nation today is slipping into jingoistic nationalism, the opposite of this ideal. With incendiary words, bombastic politics, entrenched tribalism, and the rise of bullying and racism reminiscent of Nazi days, I wonder what kind of future the next generation will face. But St. Mary's story reminds me of the ever-present, insistent power of "why not?" Her rise gives me hope that imagination might rise to meet the present crisis, rebuild our fractured democracy, and "rehallow" our ailing planet in some fresh new form. For such a miracle as this, we may need to rebuild a lost sense of our spiritual moorings, but perhaps on new soil, with a fresh idea of God and the world. I believe that divine imagination is filled with wild possibilities for what we process thinkers call "creative transformation." In fact, my theology suggests that God is the source of freshness, the reservoir of novelty, the loving and imaginative Spirit that resides in all creation. But few among us dare to engage such a Spirit of far-fetched dreams and improbable visions, for it can seem risky or unpopular or simply too outlandish for our stunted imaginations. And yet, when we do act on these persuasive lures from divine imagination, we catch a glimpse of the surprising resilience of goodness. It is the story of Easter all over again. Goodness never leaves us forever; it just gets reborn in fresh forms. My own spiritual imagination suggests that we are co-creators with a divine architect to build and re-build a world of love, justice, and beauty. But we can never restore the world exactly, for we are always inspired by fresh imagination bubbling out of the present moment. This is the meaning of creative transformation: not a wrecking ball of all that is past, but a loving repair of what is broken, transformed into fresh realms of evolving beauty. On a summer day, I like to stand in the cool shadow of St. Mary's and bask in her dignity, her resilience, and her sheer audacity of being. As I study her layers of rough, gray limestone, her journey to this place reminds me of the "Rock of Ages," that solid Presence of divine love, out of which ever-flowing, ever-fresh possibilities for transformation and healing continue to flow through history and on into eternity. Welcome to Process Musings for the spiritually curious, the creative, and the open-hearted. We, Jay McDaniel and Patricia Adams Farmer, are two bloggers from the world of process thought, inspired by the philosophy of Alfred North Whitehead. This multi-faith blog features articles, essays, stories, videos, and poetry which invite you to discover fresh possibilities for wholeness, creativity, and joy. Read more.